This book and 2 CD package is a must for all drummers wanting to explore the world of electronically produced Jungle Drum 'n' Bass grooves. 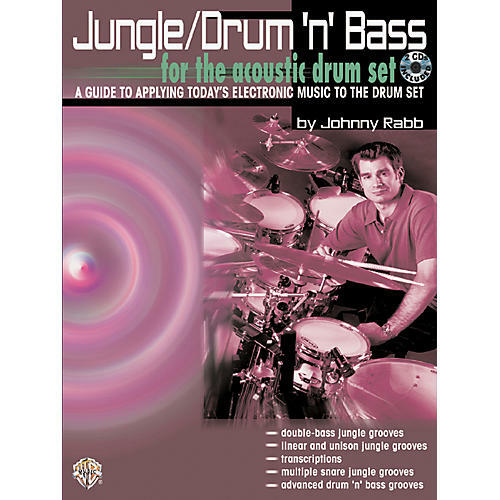 If you are new to drumming in this genre of music, Jungle Drum 'n' Bass by Johnny Rabb will open the door to new drum grooves, loops, and sounds on the acoustic drum set. It also provides a wealth of exercises, transcriptions, and sound applications to achieve the feel and style of these futuristic beats. The 2 CDs include exercise examples from each chapter, basic electronics, and 7 original groove loops to play along with. Get schooled on drum 'n' bass with these comprehensive drum lessons. Order today!